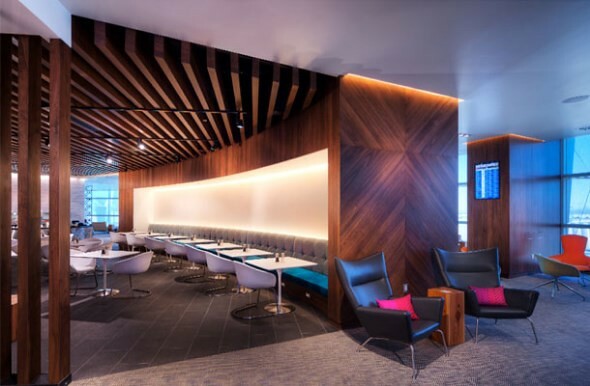 San Francisco International Airport joins the ranks alongside Dallas-Fort Worth and Las Vegas as calling home to an American Express Centurion Lounge. With no expense spared, AMEX has teamed up with the best for food, cocktails, and wine. For food, there is Chef Christopher Kostow, chef of Napa Valley’s Three Michelin Starred The Restaurant at Meadowood. For cocktails, they’ve got Jim Meehan of New York City’s Please Don’t Tell. And for wine, they have Food & Wine’s Anthony Giglio. Together, they’ve put together an incredible menu that will help free away the stress from even the worst travel days. Chef Kostow’s food focuses on Napa Valley-style cuisine, with an emphasis on seasonality. I’ve had the opportunity to sample the food and it is a far cry from the food one would typically find in an airport; even in an airport lounge. In short, the food was great, especially the slow roasted pork shoulder in apple lees vinegar. The kitchen is also a real kitchen, visible to patrons in the dining room, which is a bit unusual for what you’d find in an airport, but transparency was important for Chef Kostow. The full food menu can be seen here. Next up is cocktails. Meehan’s cocktail list celebrates what is local, with brands like Anchor Distilling, St. George Spirits, and Charbay Distillery adorning the backbar and in the signature cocktails. I sampled the Pineapple Express (Charbay Ruby Red Grapefruit Vodka, Vya Vermouth, Anchor Hophead Vodka, Small Hand Foods Pineapple Gum Syrup) and Gin Basil Fizz (St. George Botanivore Gin, lime juice, Aqua Perfecta Basil Eau-de-Vie, sparkling wine) and of all of the ingredients in those cocktails, the one that was sourced the farthest away was Vya Vermouth and even then, was just over 150 miles away. Naturally, the cocktails were delicious. Lastly is the wine…and there’s a lot of it. 21 bottles to be exact, not including two sparking wines, all served from a Wine Emotion machine and stocked only with Napa Valley wine coming from 70 miles north. It’s an incredible assortment of Napa Valley wine, which Anthony Giglio did a great job curating. The full beverage menu can be seen here. Aside from food and drink, the lounge’s other amenities include a member services desk, a shower suite, workspaces, wifi, computers, televisions, and a family room. Don’t let the name fool you and think you need to have an American Express Centurion Card to get in. While a Centurion or Platinum Card gets you in free, any AMEX cardholder can purchase a day pass for $50. While $50 isn’t cheap, it is on par with nearly all other airport lounges whose food and beverage programs very likely don’t match what AMEX is offering. For the serious traveler, I think it’s a pretty good deal.